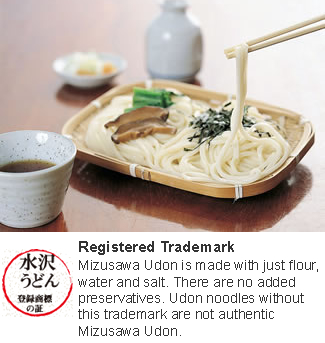 Mizusawa Udon, along with Inaba and Sanuki udon, is one of the three most famous udon brands in Japan. Mizusawa udon was originally served to the visitors of Mizuwaka Temple (Mizusawa Kannon) by the local people because they wanted to welcome the visitors with dishes made from Gunma's locally grown wheat and the spring water from Mt. Mizusawa.